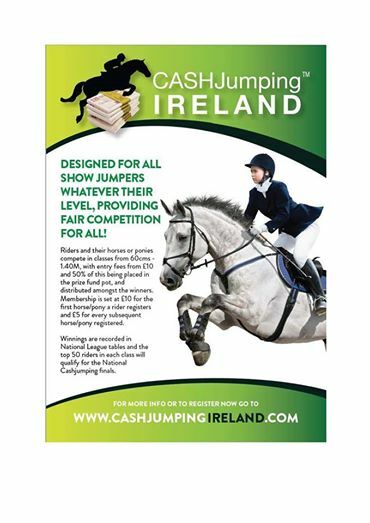 [Equihunter] The phenomenal growth in popularity of the new show jumping league Cashjumping™ continues as the first Scottish venue signs up for competitions this week. In a matter of a few short weeks since it’s launch, Cashjumping™ has made its way north to the borders of Scotland and beyond to Aberdeen with the advent of the Tillyoch Equestrian Centre signing up to hold competitions. Conveniently located just 8 miles west of Aberdeen, the Tillyoch Equestrian Centre is not only a fine competition centre, but also offers livery and training as well. Horses are accommodated in spacious stables in popular American-barn style buildings, with easy access to heated tack rooms, a wash-down areas plus a horse solarium. A range of other modern equine equipment is also available including a horse walker and an equissage. Tillyoch’s other facilities include a 40m x 80m all weather surface floodlit arena, 25m x 48m indoor arena, good hard standing, a floodlit car park and catering on site and for security full CCTV system is in place. The Tillyoch Equestrian Centre is not far off the A90 near Aberdeen and is a competition, livery and training establishment in the North East of Scotland. The Centre opened in November 2011 built from scratch by Michael and Sarah Hamilton who have been involved in Showjumping for many years, Michael is a judge and Sarah competes along with their two children. We are located in Milltimber, Aberdeen at a farm called Tillyoch which houses Tillyoch Equestrian and Aberdeen Pet Resort. Continue along (A93) North Deeside Road through Cults, Bieldside and Milltimber. [Equihunter] The phenomenon known as CASHJumping™ is sweeping the country after it’s successful launch within the last few weeks. President of the newly formed organisation Bryan Shear happily noted in a Facebook post earlier today …..
CashJumping is the brainchild of Bryan Shear and is designed to allow show jumpers of all levels to compete for decent prize money in venues with good facilities and at a reasonable cost. Within the first week and and with no marketing campaign supporting it CashJumping saw over 600 competitors register and this is continuing to grow at the rate of 50 new registrations a day. Having resolved those initial teething problems membership was firmly on the rise. The basic concept is simple explains Bryan, “entry fee is £10 a class for our stage one classes which go from 60cm to 1.40m and anyone who has not won more than £500 at Cashjumping at the relevant height can enter. 50% of all of the entry fees go into the prize fund. From the first few show centres who had already signed up, including the prestigious Netley Hall Equestrian Centre, runner up in this year’s British show jumping show centre of the year awards, the list has since grown with amazing speed and now stands at over 30 show centres, with yet more to follow. For the show centre’s approved to run these classes there are benefits too. No affiliation fees, no class fees and a series that appeals to riders of all levels, with a prestigious final at the end of the season to look forward to. The Cashjumping website www.cashjumping.co.uk can be used to market the shows and the centre’s are able to view the registered riders by area and see the level of demand for the shows and communicate direct with their local competitors to make sure the schedule reflects what the local riders want to see. How was this all possible – Bryan explains…. “The fact is that everybody is having to look to reduce costs where they can and if local centre’s can put on quality shows with good facilities using accredited course builders and judges at a reasonable cost with a decent return the savings for the competitors in diesel, entry fees and membership costs can be huge”. “We see this as something that will bridge the gap between the British Show jumpers and the unaffiliated riders”. “Yes of course it is expensive even for the professional yards to register and compete all of their horses at BS shows, and there may be some people who decide not to register all of their youngsters straight in at BS level, but any loss of income should be more than compensated for by an increase in the number of unaffiliated riders who go Cashjumping compete against their BS counterparts and realize that BS is not some sort of holy grail reserved for the rich or professional rider”.